Pamela Golden's new work creates an uncanny feeling of disjointedness. Exploring the dichotomy of society and nature, of inner and outer worlds, her series Even the car is dead. looks at how, although we apparently dominate it, something about nature remains unknown and unknowable. Large white frames contain small, detailed paintings of family scenes inspired by found photographs. Golden overlays each photograph with new images and memories. At first glance, this seems to be a continuation in painting style and content of her previous work. But the differences in her new work are as striking as the similarities. The paintings in Even the car is dead are larger than her previous work about the size of Polaroid photographs. Colours are brighter and more vibrant. Starting with the subject matter of leisure time, the works induce a feeling that something is not quite right, that if we scratch the surface of these normal lives and normal pursuits, something horrible might emerge. The people depicted are too happy, their environments too controlled, the colours a touch too bright. The sense of disjunction is heightened in a work such as Somewhere in Nowhere, in which people are shown relaxing and savouring their leisure, while the title conjures a feeling of desperation. Even the car is dead includes two large watercolour scrolls. Depicting swamp-like landscapes, the six-foot high black and white paintings almost engulf the viewer. Evolving from an examination of the horror film genre, particularly films of the 1930s, the swamp scenes play on our fear of something lurking beyond. 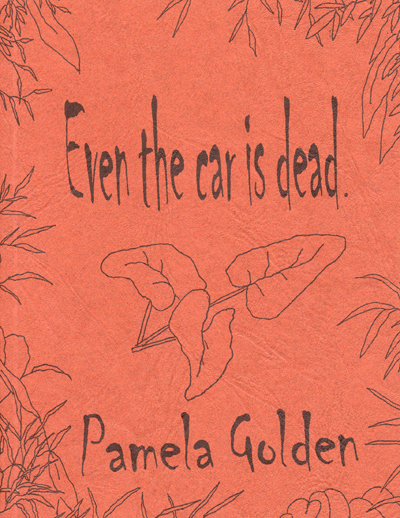 The title of the series Even the car is dead. is taken from a sentence in The Black Cat, a film starring Bela Lugosi and Boris Karloff, based on a story by Edgar Allen Poe. Many horror films are about the presence of something horrific beneath the visible surface. Underlying Golden's scenes of leisure and relaxation is the sense of an ominous presence which threatens to pierce the fabric of buildings, crawl under our skin, and breach everything that protects us from 'out there'. By juxtaposing the swamp scenes with works such as For Approximate Decisions, in which the sheet glass modernist building separates the controlled indoor environment from the uncharted terrain outside, Golden challenges our fear of unknown nature, while asking why we insist on controlling it.